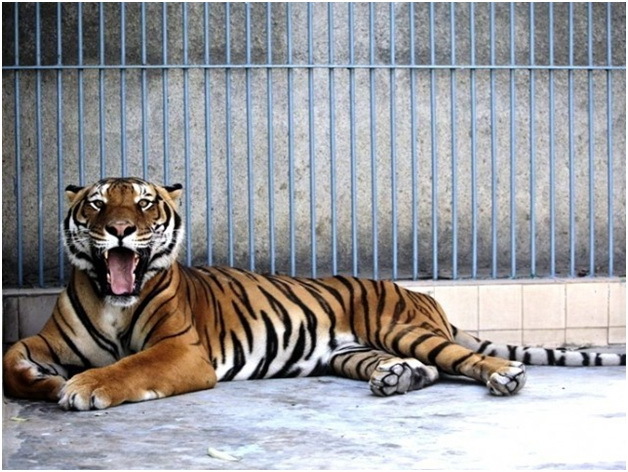 Karachi’s zoo is about to lose another one of its Bengal Tigers –– this will be the fourth one. The previous one died in November 2012. All efforts, as the zoo administration puts it, have failed to help recover the ailing tiger, who is young and was imported only two years ago. The tiger is suffering from a disease that directly concerns its intestinal tracts, due to which the animal has lost considerable weight and the ability to digest. But instead of aiding the tiger to recuperate as much as it can, the zoo administration failed to shift it to a different facility and away from the discomforting heat. Though a requisition has been submitted to higher authorities to shift the tiger, that request has not been processed and may take time. It seems that regardless of whether a life or death situation is at hand, our bureaucracy never fails us when it comes sticking to its ways. Not only is it the job of the zoo and the wildlife department to ensure the safety and wellbeing of these animals, but to also keep the few things left in the city for the recreation of its residents intact. As has previously been the case, zoo animals have died due to the utter negligence and ignorance on the part of the staff. In 2012, a baboon and a red deer also died after being mishandled by zoo staff. That was indeed a deadly year for the Karachi zoo as six animal perished back to back within a few months. The ailing Bengal Tiger and its mate were bought in 2012 for a whopping Rs7.1 million. Considering that the animal has been classified as endangered and was imported without the necessary permit from the National Council for Conservation of Wildlife, why were they allowed into the country by authorities in the first place? The matter should be thoroughly investigated so that similar blunders in the future are avoided and we do not become the cause of extinction of such species.